A team doesn't reach the Stanley Cup Final without good goaltending. With the competition intense and so even, the men protecting each goal often are the difference in a series, and that has been the case again through the first three rounds of the 2014 Stanley Cup Playoffs. Now it is is a battle between 2012 Cup winner Jonathan Quick of the Los Angeles Kings and Vezina Trophy winner Henrik Lundqvist of the New York Rangers for the right to raise the Stanley Cup later this month. Who has the upper hand? 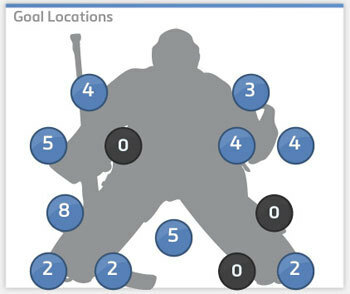 Much like many goaltending coaches will do before a playoff series, NHL.com Correspondent Kevin Woodley, managing editor of InGoal Magazine, used the 360 Save Review System software from Double Blue Sports Analytics to chart each goal scored against each goalie this season, and he came to some interesting conclusions about their strengths and weaknesses of the two. It's difficult to imagine a more compelling goaltending battle for the Stanley Cup, or a better test case to prove there is more than one way to stop a puck. The matchup between Quick and Lundqvist is a study in opposites in terms of where they make most of their saves and how they get there. Quick is among, if not the, most aggressive goalies in the NHL, challenging well outside his crease. He plays an outside-in style, retreating back toward his net and usually staying low, often even on his knees, as he does. Lundqvist is an inside-out goalie, starting from the goal line and staying deeper in the blue ice, staying patient and up on his skates longer than any other goaltender in the NHL. They couldn't be more different in their approach, which makes for interesting breakdowns as teams figure out plans to attack them. Quick is one of the NHL's fastest goalies, which is good because he needs that explosive mobility to cover off his aggressive positioning. 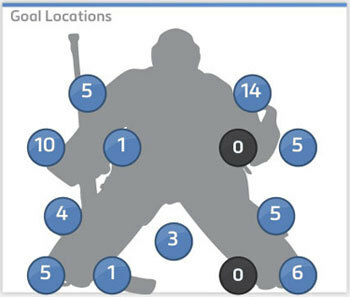 He not only plays rush chances several feet above his crease, but he can also get well outside the blue ice during end-zone play. He makes it work with incredible lateral mobility and great defensive support. As we saw against the San Jose Sharks early in the Western Conference First Round and again at times against the Chicago Blackhawks in the Western Conference Final, without that stingy defense, playing to such extremes can be exploited. When he's on -- Some goalies are at their best playing a quiet game, but Quick is always moving. When he's locked in, the movements remain controlled, even when he's down, sliding back and forth with his torso slightly upright and his hands up and active. When he's off -- When Quick is pulling up and looking over his shoulder on shots, it's usually a sign he's not tracking the puck well, which causes him to open his torso rather than tracking down on the puck and cutting off its vertical path earlier, out in front of his body. It's no surprise most goals involve a lateral play, not only because plays which force movement lead to lower save percentages in general, but because Quick moves more as a result of positioning. Almost two-thirds of his 100 regular-season goals at even strength (and nearly half on the power play) involved movement, and a majority were finished by one-timers or quick shots, whether on a cross-ice pass or rebound. Those trends continued in the playoffs, with Quick often caught scrambling to recover from his early aggression. This showed up in more goals along the ice in the playoffs so far than the entire regular season. After four on each side in 49 regular-season games, Quick has already surrendered five along the ice on the blocker side and six on the glove in 21 playoff games. A couple of these came after getting beaten uncharacteristically on sharp-angle plays, but many of these easy tap-ins came after getting caught out of position with aggressive play, often off the rush. Elevation a must -- Unlike most goalies who barely manage to get a pad across in desperation moments, Quick usually stacks his vertical coverage with the glove or blocker arm atop the leg pad. He rarely throws himself across blindly, tracking the puck and maintaining mobility through his torso, even while doing the splits in a lateral slide. So it's important to elevate quick shots because anything low gives him a chance to combine his explosive pushes with a Gumby-like flexibility to turn what looks like a sure goal into a momentum-changing save. Just ask Chicago defenseman Brent Seabrook, who was robbed by a sliding, full-splits Quick, a save that turned around Game 2. Teams have taken notice and are elevating, with 14 high-glove goals in the playoffs already after 15 allowed by Quick during regular season, and the mid- and high-blocker totals are also similar in less than half the games. Sell the fake -- Given his aggressive nature, selling a fake shot from up high to draw Quick out before making a lateral pass can buy time. The Anaheim Ducks took advantage of a variation of this to score a couple of power-play goals in the Western Conference Second Round, with open players at the side of the net throwing the puck back up into the middle or cross-ice rather than trying to stuff it through Quick when he challenged them down low in tight. Odd-man high -- Almost one-third of the even-strength goals in the regular season were off the rush (20). But instead of typical passes in tight on odd-man opportunities, crisp passes high in the zone work because his aggressive positioning leaves more distance to cover laterally, which can expose him to one-time goals into the far side of the net. The Sharks continued this trend in the first round. Make him smaller -- In the regular season, about one-third of even-strength goals against Quick included screens or deflections, which can push him deeper in the crease than preferred. It's continued in the playoffs, with teams taking away his eyes with traffic and then using higher shots to take advantage of his lower crouch, another part of the reason his mid-to-high goal totals in 21 playoff games are already approaching his regular-season totals. Attacking with low-high passes from below the goal line also works by forcing Quick to push off the post and get back the top of the blue ice. He gets there faster than most, but it increases the opportunity to catch him moving. Sharp-angle attack back -- Quick's post play is normally the envy of many NHL goalies, including a technique copied widely after his Cup win. He moves on and off his posts seamlessly and gave up five dead-angle goals all season, but was burned four times on sharp-angle attacks by the Ducks in the second round, gave up an uncharacteristic wraparound goal against Chicago and was caught on another quick shot from above the goal line in Game 7. Attack the glove? -- In addition to the aforementioned screen shots, it's interesting that Quick's high-glove goal percentage up in the playoffs, as well as the shots going in from the glove side, with 22 percent of goals coming from that area compared to 11 percent in the regular season. There have certainly been times when Quick's tracking has been poor and has caused him to pull off shots on that side, which might be enough to encourage more attacks from there. Even Lundqvist says he "plays deep," but a more accurate description of the approach taught to him by Rangers goaltending coach Benoit Allaire is "goal line out." It leaves Lundqvist making more saves at the back of his crease, something with which he is very comfortable. But he will attack plays when he needs to, and has started coming out past the top of the blue ice early on breakaway chances before retreating. Lundqvist's staple, though, remains that deeper positioning, allowing him to beat lateral plays with quick, short movements and giving him more time to read shots and tips and make reactive saves. When he's on -- Lundqvist patiently waits out shooters and reads the play on his skates as it develops on the outside, then constantly makes small readjustments from his knees closer to the net. When he's off -- He gives up more clean-shot goals, understandable given his depth, so if Lundqvist isn't battling for sightlines to make those late reactive saves he can look passive instead of patient. The season totals show great balance, with a nearly identical split on each side. Lundqvist told NHL.com his struggles the first half of this season were the worst of his professional career. The harder he tried to get out of the funk, the worse it got, in part because it led him to be more aggressive and get away from his deeper style. "Sometimes it's hard to stick to basics when you are not having the results you want. You try too much," he said late in the season. "For me, it's about staying deep and just believing in my ability." Lundqvist renewed his faith in that philosophy early in the New Year and turned around his season. Because he deviated so much in the first half from the style which defined his first nine NHL seasons, the written analysis looks closer at 2014 goals, playoffs included. Blocker side better? -- Lundqvist elevated his glove position years ago to try to take away some of the open net shooters see behind his deeper positioning and used a stiffer practice glove that stayed more open and appeared to cove a bigger area. Though there was balance during the season, he gave up eight goals high on the glove in 47 games through the end of the Eastern Conference Second Round in 2014, compared with 14 in the first 30 games. In that same time frame in 2014, 31 percent of the goals against him were elevated on the glove side compared with 41 percent on the blocker side. Unlike the glove, Lundqvist can't hold his blocker any higher without compromising his stick position, and appears to be more vulnerable high-blocker. Through the first two rounds of the playoffs, 16 of 27 goals went in mid-to-high on the blocker side compared to eight on the glove. The majority of goals (20 of 27) were also scored from the blocker side of the ice during that time, yet the Montreal Canadiens seemed to target his glove, especially early in the Eastern Conference Final. In the first two games the Canadiens fired 17 shots to the glove side, including several of their best chances, and scored once. In the same time they shot 10 times to the blocker side, scoring twice. Stretch him out -- Deeper positioning allows Lundqvist to use his feet to beat passes with quick, short movements. But he can get sprawled out, and often ends up falling forward on moves across the middle of the ice down low or lateral passes in tight, leaving plenty of space if a shooter can hold on wide enough and elevate the puck. The same applies to breakaways, with a better chance for success coming from adding a a lateral element to the attack, whiches forces him to stretch out to maintain coverage. Sharp-angle rebounds -- Lundqvist still uses VH to cover his posts on sharp-angle attacks from above the goal line. This technique, in which the goalie stacks the lead pad vertically up against the post and leaves the back pad horizontally along the ice, cost him a handful of leaky goals all season, including the one he gave up in Game 7 against the Philadelphia Flyers. It can also leave dangerous rebounds in front, which led directly to goals in the first two rounds. 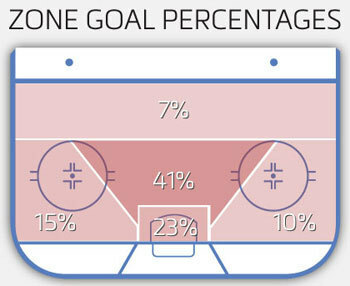 Get to the middle -- It's always going to be easier to score on any goalie from the middle of the slot, but 54 percent of regular-season goals in this area was the highest tracked so far, and an indicator of the cost of playing so deep when defending breaks down. The Reduction to 41 percent in the playoffs may help explain why Lundqvist and the Rangers are now playing for the Stanley Cup. 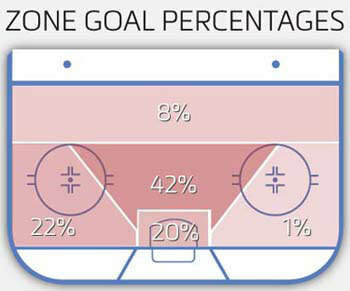 Go low -- Many will wonder if shorter pads play a role in the 29 goals which beat Lundqvist through the five-hole, but much like the 21 along the ice to the sides, playing so deep means extending the pads more to make low saves, which is going to open holes. It also means low shots through traffic aren't a terrible idea against the Swede. Glove-side rebounds -- Lundqvist is great at getting at least a piece of pucks destined for the glove-side corner and frequently forgoes a traditional butterfly for a half-butterfly when he reads a shot is elevated, keeping up his left leg. This incredible reactionary ability, combined with that stiffer glove which barely closes, can produce rebounds. He did a great job cradling and holding onto most of these shot in the Eastern Conference Final, but shooters shouldn't idly admire what they thought was a perfect top-corner shot.